NOTE: This event has been rescheduled for March 14, 2019 at 7 PM. 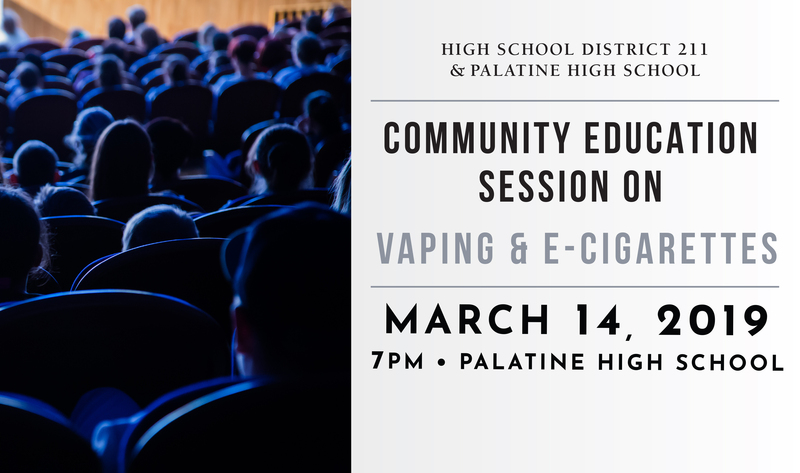 Township High School District 211 will host a Community Education Session discussing the dangers of Vaping and E-Cigarettes at Palatine High School January 31, 2019, beginning at 7 p.m. The session will be available in both English and Spanish, and child care will be available in the school’s media center café. Palatine High School Assistant Principal Tony Medina said the session will provide parents with educational information on vaping as well as inform them on the dangers of the habit, and support available for educating their children. Medina will present the Spanish session, while a representative from F.A.I.R. Counseling will present in English. Community education is important to High School District 211 and involvement will help our schools strengthen the commitment to serve all students. All sessions are open to the public and offered free of charge. Light refreshments will be available.